Austin Walker admitted to a little envy toward his audience: students he once was. A couple of years ago, Walker was a Grand Canyon University student. 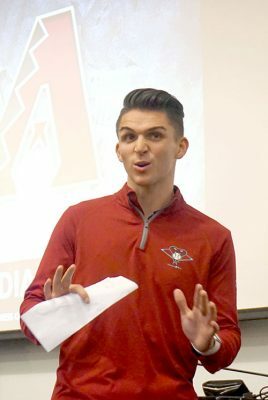 He would have been one of the nearly 300 students who listened to members of the Arizona Diamondbacks sales staff speak Thursday morning about career opportunities, networking and getting a foot in the door. Austin Walker, a 2015 GCU graduate who now works for the Arizona Diamondbacks as coordinator of group events and hospitality, speaks to a class of Colangelo College of Business students Thursday morning. While the Sports Business program within the Colangelo College of Business quickly rose to prominence, Walker used volunteer work and internships during college to help land a full-time job as the D-backs’ group events and hospitality coordinator after graduating in 2015. Two years later, Walker is a speaker instead of listener. “It’s fun to speak to people who have a blank slate and help them invest in their career paths,” he said. Anthony Synegal explains what he does as director of group events and hospitality for the D-backs. Afterward, the five guests were swarmed by students interested in networking, asking questions, sharing business cards and possible aspirations. 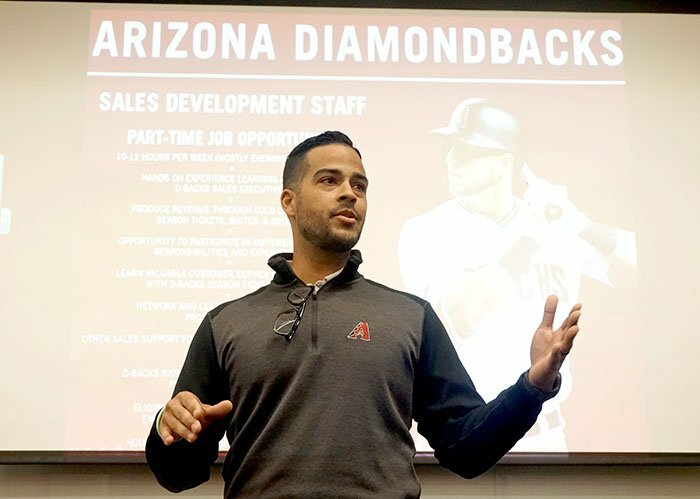 Important initiatives because, as Dellosa noted, Walker is one of several current or former GCU students hired in recent years by the Diamondbacks – and other Valley sports franchises — for internships and jobs. That includes Walker, who worked himself into the crossroads of employability and opportunity in 2015 and wants to do his part in helping each class thereafter.